Sitting all day isn’t great for you – our sedentary lifestyles have recently been called even more dangerous than smoking. One of the more popular ways to combat this sitting epidemic is to work at a standing desk. While this method is excellent for your health, most standing desks are ridiculously expensive. 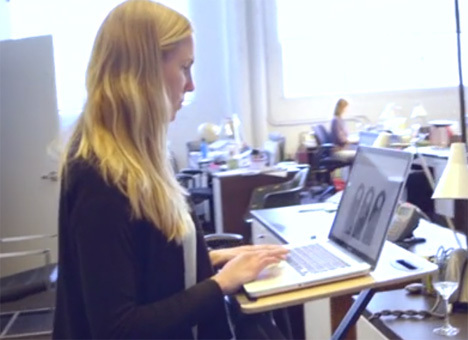 The StorkStand makes standing desks affordable for everyone by using something you’ve already got but don’t need if you’re going to start standing up at your job: your desk chair. The StorkStand is a platform that attaches to the back of your chair to provide a stable work surface complete with an iPhone holder. 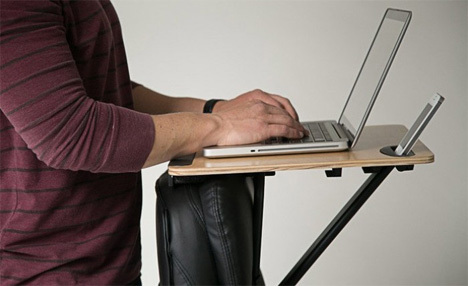 It works on any office chair that can be raised to the appropriate height. The mechanism is quite simple: the end nearer to the user rests on the chair’s back and two braces hold it steady. A strap provides stability and security so your expensive laptop doesn’t go tumbling to the ground. With a weight capacity of 50 pounds, you can even put a few more things on the StorkStand with no worries. Since most office chairs have wheels, it’s safe to say that the StorkStand makes your workstation easily portable. 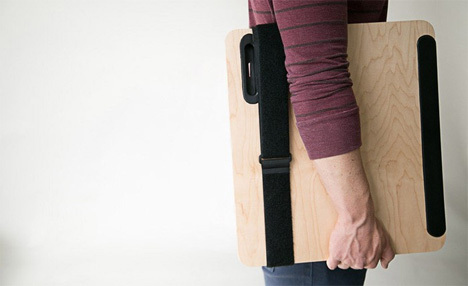 When you aren’t using it, its compact folded size and light weight (a smidge more than four pounds) make it easy to carry between work and home, or store it between your sitting desk and the wall until you need it again. Multiple degrees of adjustment let you choose the right position for your roving desktop. 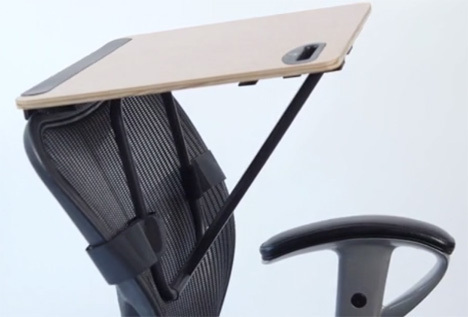 The clever designers behind the product have made sure that weight is evenly distributed so you don’t have to worry about your chair tipping over while it’s got your office tools all over it. StorkStand’s Kickstarter campaign was a success, and the company is now taking $199 pre-orders for handy portable standing desk.